Spontaneous Scalarization: Dead or Alive? 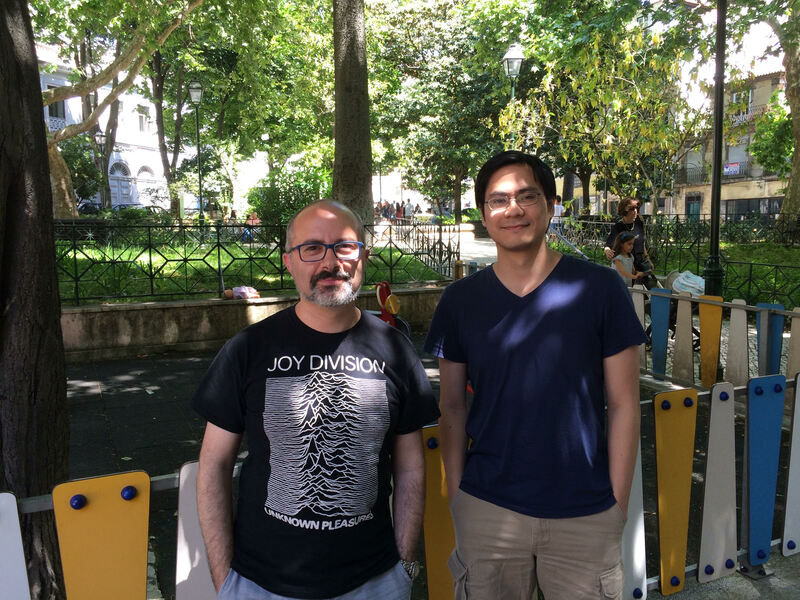 Hector O. Silva (right) is a graduate student of Professor Emanuele Berti (left) in the gravity group at the University of Mississippi (USA). This is a time for celebration for anyone with even a passing interest in gravity. Einstein’s general theory of relativity is turning 100, Advanced LIGO started the first observing run on September 18, and LISA Pathfinder is scheduled to launch in the Fall. While we celebrate the centenary of general relativity, we should also remember that there are many good reasons why the theory may well require modifications. Cosmological observations indicate that most of the Universe is composed of poorly understood dark energy and dark matter components, which could be “explained away” by modifying the behaviour of gravity at large scales. On the other hand, the classic Hawking-Penrose singularity theorems (and the well known difficulties in quantizing gravity via traditional quantum field theory techniques) suggest that it may be necessary to modify Einstein’s theory also in the regime where gravitational fields are strong and curvatures are high. One place where these strong-field modifications may show up – if they exist! – are neutron stars. Neutron stars challenge our understanding of physics in many ways. The details of how they form via gravitational collapse are still unclear, the composition of matter in their interior is presently unaccessible to laboratory experiments, and their compactness means that they are associated with extremely large gravitational fields. The simplest proposed modification of general relativity (and one of the few that managed to stay alive for more than 50 years – not quite as old as Einstein’s theory, but pretty close to retirement age by human standards!) is scalar-tensor theory. Back in the 1990s, Damour and Esposito-Farèse studied neutron stars in scalar-tensor theories and they found a remarkable result: scalar-tensor theories can be compatible with Solar System experiments and still produce large modifications in the observable properties of neutron stars, such as masses and radii. The reason is that when a certain theory parameter is negative, the coupling between matter and the scalar field can take the form of a Mexican hat: general relativity is an unstable equilibrium sitting at the top of this Mexican-hat potential, but a star with fixed baryonic mass will prefer to “roll down” to the energy minimum located at the bottom of the Mexican hat, where the scalar field becomes nonzero. This phase transition is analogous to spontaneous magnetization in ferromagnets, therefore Damour and Esposito-Farèse called it “spontaneous scalarization”. Theory predicts that spontaneous scalarization can only happen when , where . If it happens, the gravitational radiation from binary pulsars will be modified from the predictions of general relativity: some dipolar radiation will be emitted, and the dipolar emission depends on the amount of scalarization. 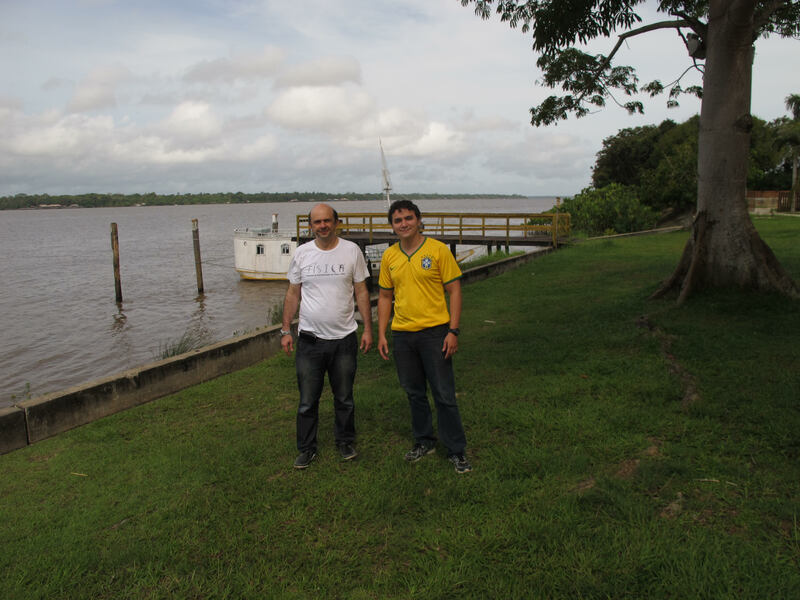 Caio F. B. Macedo (right) is a postdoctoral fellow with Professor Luís C. B. Crispino (left) in the Grav@zon group at the Federal University of Pará (Brazil). In recent years, pulsar astronomers have done a fantastic job at monitoring binary pulsar systems. They have not completely killed spontaneous scalarization yet, but they did manage to put it in a very tight corner: the latest observations imply that , and this value is getting closer and closer to . Spontaneous scalarization is not dead yet, but we can all agree that it’s not feeling very well. Now, this conclusion relies on one implicit assumption: that the matter inside neutron stars is isotropic. Isotropy is a very solid assumption: some nuclear physics practitioners look at high-density matter anisotropies the same way that you would look at a fly in your soup. However, recent work suggests that relatively large anisotropies could be produced by strong magnetic fields, and they also emerge in some nuclear physics calculations of the high-density equation of state, e.g. those based on the Skyrme model (a low-energy effective field theory of Quantum Chromodynamics). In our paper we compute the threshold for scalarization for a large sample of equations of state under the assumption of isotropy, and we find that the value of the critical parameter for scalarization ( ) is basically insensitive to the equation of state. Then we ask the question: could anisotropy “save” spontaneous scalarization from the ever tighter constrains from binary pulsar observations? To answer this question we compute (slowly rotating) anisotropic neutron star models using two simple models for the degree of anisotropy: a model proposed by Bowers and Liang in 1974, and a model proposed more recently by Horvat and collaborators. Our main finding is that scalarization has stronger effects on the mass-radius relation when the tangential pressure is larger than the radial pressure, and vice versa. Moreover, anisotropy also affects the scalarization threshold: in the most favorable cases, scalarization in anisotropic stars can happen when , enlarging the allowed range with respect to the case of isotropy. Unless someone comes up with truly compelling arguments to constrain the degree of anisotropy in high-density nuclear matter, it seems likely that spontaneous scalarization will stay alive for a while and reach retirement age. Our work has already produced a very interesting follow-up. Isotropic stars in general relativity must satisfy the Buchdahl bound ( ), and therefore there is no way of taking the “black hole limit” unless one gives up the assumption of isotropy. The radius of constant-density stars in the Bowers-Liang model tends to in a certain limit for the anisotropy parameter. Yagi and Yunes used this observation to show that the low-order multipole moments exterior to an anisotropic neutron star tend to the corresponding black hole value in this limit: very anisotropic constant-density stars seem to become bald (in the sense of the general relativistic no-hair theorem)! This is a very interesting result, and we believe that studies of anisotropic neutron stars will give us more insight on the difference between black holes and neutron stars. In this figure we show the threshold value of for which spontaneous scalarization can occur. Given an equation of state, scalarization is possible for values of below the maximum of the curves. For isotropic stars (left panel), this threshold is around (golden horizontal line), independently of the equation of state. However, if we include anisotropy (right panel), whose strength is controlled by the parameter , the threshold depends on the sign and magnitude of . Finally, a little note about us. This paper was the result of a collaboration between the University of Mississippi and Pará University in Brazil. The collaboration was made possible by a collaborative network funded by the European Union that involved four more nodes: Lisbon and Aveiro (Portugal), Barcelona (Spain) and Rome (Italy). The last meeting of the network will be held in the Belém Campus of the Federal University of Pará, and it will be an excellent chance to visit the Amazonian region of Brazil and celebrate 100 years of general relativity. You are all invited! This entry was posted in Author Insights, IOPselect and tagged general relativity, gravitational waves, neutron stars by Claire Fullarton. Bookmark the permalink.